In 2017, four new municipalities became Sustainable Maryland Certified, and nine municipalities became re-certified, for a total of 39 certified municipalities. In total, 69 municipalities are currently registered with the Sustainable Maryland program. To become certified, municipalities must provide documentation of an active Green Team, completion of at least two of six Priority Actions, and completion of at least 150 points worth of Actions. Utilized local goats from a local farmer to remove invasive plant species twice per year from Rockfield Park. Marked its 25th year as a Tree City USA community. Offers a variety of health and wellness activities and incentives to municipal employees. Adopted a Green Purchasing Policy to help ensure more environmental friendly procurement of goods and services. Hosted four Maryland Certified Green Schools. Celebrated the 41st year of its downtown Farmers Market. Launched a new Community Garden in 2016, offering 70 garden plots to local residents. Created a Green Team Facebook page to serve as a sustainability resource center for residents. Installed energy-efficient LED lighting at town facilities. Hosted a free rain barrel workshop, providing 30 residents guidance on assembling their own rain barrels. Established an innovative Forest Mitigation Bank, which off-sets development within town by preserving land within a 45 acre town-owned forest. Hosted the annual Boonsboro Green Fest since 2009, with the number of vendors doubling from 84 the first year to over 160 in 2017. Received its first Tree City USA award in 2015, and followed up in 2016 Growth Award for performing a new tree inventory analysis. Adopted Water Conservation Plan in 2017 that provides information on the existing system, water audits, projected demand, planned improvements, conservation measures, and public education. Adopted the National Wildlife Federation’s Mayor’s Monarch Butterfly Pledge, which commits the town to providing much-needed habitat for butterflies, including a Boy Scout project that created a Monarch Waystation at Shafer Park. Created a “living wall” along a streambank within town parkland, helping prevent erosion and improve water quality. Adopted a Green Purchasing Policy to help guide environmentally friendly procurement of goods and services. Celebrated the 10th straight year of the Burkittsville Rain Barrel Program. Received a grant from the Chesapeake Bay Trust to develop and implement a Green Streets and Stormwater Management Master Plan. Developed the “Pump ‘Em Out Challenge” to encourage residential septic pumping through the distribution of educational resources and information for local septic contractors. In January of 2016, the Mayor and City Council committed to a Sustainable Procurement Policy, which includes reclaimed materials from the Little Red Green Barn project. Developed several innovative programs to support the local food economy, including a Backyard Produce Exchange, Local Food Directory, an annual Farm-to-Fork Town Picnic, and the Burkittsville Food Forest. Supported their Green Team’s online Resource Center in 2016 by providing “Green Welcome Kits” to all new residents and interested existing residents. The local “Beach Bots” robotics team participated in a civic engagement project at Beach Elementary School, focused on reducing residential waste in the area. This required the students to write a report about different ways to reduce waste at home and the importance of reducing waste in their community. The Town hosted multiple volunteer stream clean-ups along sections of Fishing Creek. Additionally, several osprey nests and monitoring cameras were installed by the town in Fishing Creek Marsh, with a live stream available to the local residents through the town website. Direct promotion of a Nature Walk series led by The Bayfront Park Committee and Dr. Ken Rasmussen through local residential and academic communities. The Town continues to support local biodiversity efforts in partnership with the Chesapeake Beach Oyster Cultivation Society (CBOCS). These include the establishment of a public pollinator garden and “hotel”, as well as a garden dedicated to mosquito-repellant species. Amended a previous ordinance to allow bees on both residential and municipal property. This was quickly followed by the installation of two new apiaries in the Community Garden. Celebrated the 21st consecutive year in which Cheverly has been recognized as a Tree City USA community. In June of 2016, with support from the Chesapeake Bay Trust, Cheverly hosted “The Great Cheverly Rain Barrel Event” to help residents simultaneously purchase a 50-gallon rain barrel and apply for the Prince George’s County rain check rebate program. The town is working with Gladys Noon Spellman Elementary School to maintain their Safe Routes To School Program, which is currently in its fourth year. This program contributed to Gladys Noon Spellman being identified as a Silver-level Healthy School by the National Coalition for Healthy Schools. 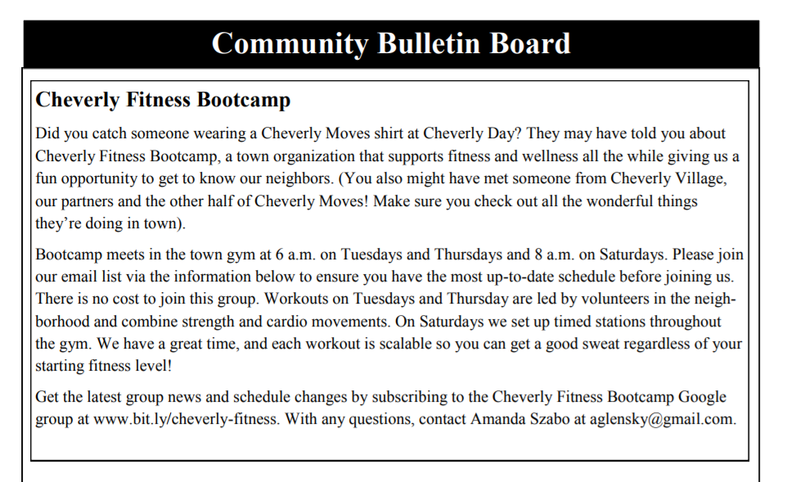 Beginning in 2015, Cheverly has partnered with several private sponsors to host the “Cheverly Fitness Bootcamp”, a free, weekly event led by volunteers to promote healthy lifestyles for residents. Frostburg is celebrating over ten years of supporting a branch of the Allegany County Farmers Market, which they have recently expanded into an indoor venue at the Frostburg City Place. In addition, the city now supports an expanded, winter season market at the Mountain City Traditional Arts Center. Frostburg continues to promote its Buy Local campaign by partnering with Frostburg First Main Street to organize appreciation events for locally owned businesses. In the past year this has included Small Business Saturday, the Handmade Holiday Fair, and the second annual celebration of Frostburg 101, an outreach event that exposes students at the University to local vendors. Celebrated the third consecutive award year for Tree City USA in 2016, and plans to expand Tree City efforts in 2017 through additional funding for tree care and combining the Arbor day celebration with “Beautify the Burg”, the city’s official community volunteer day. The city worked with the Mountain Maryland Solar Co-op, Frostburg First, and MD SUN to organize and facilitate a residential solar installation project with Big D Electric in the fall of 2016. In April of 2017 the city council passed a new local ordinance, allowing residents to keep small numbers of chickens on their property within the city. 2017 marked the 63rd year of the annual Greenbelt Labor Day Festival, a four day event that supports community education and outreach. A few of the many environmental issues the fair educates visitors and vendors on are proper recycling, rain barrel installation, and residential energy efficiency, as well as awarding the honor of Greenbelt’s Outstanding Citizen. In 2017, the Chesapeake Education, Arts and Research Society (CHEARS), with support of the Greenbelt Community Foundation, launched two new citizen science co-learning and community building projects centered on learning how to build soil quality through composting and the ways in which plants can help local climate resiliency. In 2013, Greenbelt’s DPW initiated a food scraps composting program, and has since educated community members about composting at 22 different festivals and community events since. Additionally, the Green Team’s Zero Waste Circle has created an Organics Task Force which is researching City-wide compost options and the respective pricing. The Mount Airy Main Street Farmers Market went through a rebirth in 2016, continued into 2017, that brought in over 30 new vendors and 30 times the number of visitors compared to the end of the 2015 season. In 2015, Mount Airy took a step forward in supporting renewable energy by installing an electric vehicle charging station in the Municipal Parking Lot at Park Avenue and Cross Street. In October 2014, The Town of Mount Airy entered into an agreement with Carroll County Government to partner in the cost-sharing stormwater Mitigation Projects and Co-Permittee responsibilities, in efforts to maintain and improve the 35 storm ponds within Mount Airy. Feel the Churn Butter Aerobics was held on June 14, 2017 in partnership with the Mount Airy Farmers’ Market and a local networking group, Woman in Motion. The event focused on health information for residents and raising funds to benefit the Central Maryland Making Strides Against Breast Cancer organization. The North Beach Sunrise Garden, opened in 2015, is a 30,000-square-foot parcel of reclaimed waterfront area owned by the Town of North Beach. The park features pedestrian walkways; public seating; landscaping with native plants; water features consisting of rain gardens, shallow ponds, and waterfalls; a public gazebo; rotating public art displays; and more. Innovative municipal initiatives include solar panels at the Public Works building and a green roof on Town Hall. Every year the town of North Beach hosts several events that showcase local cuisine, promote local businesses, and support local nutritional assistance programs. In 2017, these events included “Drink Maryland,” “The End Hunger Dragon Boat Festival,” and an annual “Polar Bear Plunge” co-sponsored by Calvert County Meals on Wheels. In 2016, North Beach secured grant funding from the Fish and Wildlife Foundation to complete a 60-foot living shoreline project inside the Walton Beach Nature Preserve. The Maryland Urban and Community Forest Committee presented the Town of Riverdale Park, with the People Loving and Nurturing Trees (PLANT) Award for 2016. This award recognized the Town’s hard work in tree planting and care throughout 2016. Riverdale Park plans to replace the 5,400 sq. ft. flat roof on its Town Hall building with a more efficient “white roof”. Once completed, the project would make Riverdale Park the second municipality in the state to incorporate the white roof technology. Completed a stormwater study of urbanized Wells Run, the primary stream corridor within the town. Riverdale Park will be receiving a grant from the MD Department of Transportation to create bicycle paths and infrastructure to link the Anacostia Tributary Trail system, the Rhode Island Trolley Trail, Route 1, and Kenilworth Avenue with local businesses and destinations in Riverdale Park. Takoma Park actively supports and promotes two separate farmers markets within the town. The Old Town Market is a full-year market that relies on city funding to operate, while the Crossroads Farmers Market is a self-sustaining summer/fall seasonal market. In addition to Takoma Park being an active participant in the Montgomery County Solar Co-op, the town has reached maximum municipal roof solar capacity. In addition, the city purchases the rest of its municipal electricity through wind credits and has plans to complete the installation of 1500 solar-powered, LED street lights by the end of 2017. From 2014 - 2016 Takoma Park participated in the Georgetown University Energy Prize competition. This novel and unique nation-wide competition was designed to lower residential and municipal greenhouse gas emissions through a focus on energy efficiency. Overall, Takoma Park estimates its participation in the prize competition to have saved over 2 megawatts annually. As part of Takoma Park’s Neighborhood Energy Challenge the City deliberately planned to integrate community building into the larger challenge to reduce energy use. This process involved local residents attempting to reach sustainability goals as a participating member of one of 18 different, competing citizen groups. 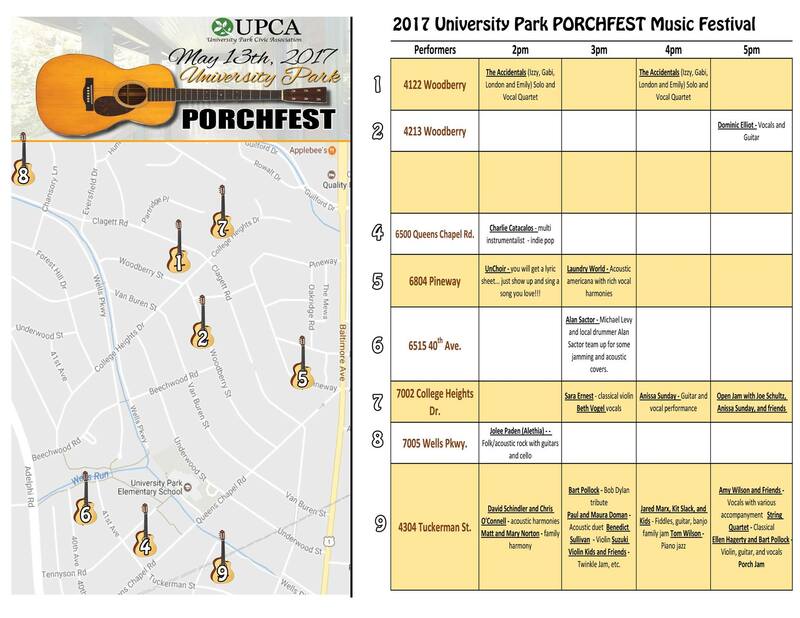 University Park has been a Tree City USA since 2004, and received the People Loving and Nurturing Trees (PLANT) award in 2016. University Park funds and promotes a Shade Tree Reimbursement program for residents. The town may offer reimbursement of up to three hundred dollars ($300.00) toward the purchase price of any tree listed in the official town shade tree list that is planted on private property. Launched the "Take Back Our Yards" mosquito control program, installing hundreds of traps in yards and eliminating breeding areas. The Town guaranteed funding to Helping Hands UP, a program that assists local seniors remain safely independent in their own homes by matching seniors with volunteers to help with tasks such as grocery shopping, in both the 2017 and 2018 budgets. In the Fall of 2011, the Town of University Park launched its food waste compost pilot project with 50 volunteers using resources from a U.S. Department of Energy grant (the STEP UP Program) and an outsourced vendor. As of June 2017 the number of households participating had grown to 208 out of the town’s 915 residences. Approximately 60-70% of those households participate on a weekly basis and average about 8 lbs per house/week. Is this the country’s first electric Bolt police car? Sustainable Maryland hosted three Leadership Training Workshops in November 2017 on the topic of Sustainability Metrics: Measuring What Matters. Workshops were held in Cambridge, Hyattsville and Hagerstown, with more than 80 elected officials, municipal staff and Green Team members attending. Sustainable Maryland hosted our third Prince George's County Green Team Summit in April 2017, on the topic of Pet Waste Management. Representatives from more than fifteen municipal Green Teams attended. Sustainable Maryland staff conducted six Wednesday Webinars in March and April 2017 on a variety of topics, including green streets, urban tree canopies, green festivals, mosquito control, green schools, and tips for successful SM certification application. For more information on Sustainable Maryland programs, as well as other sustainability-related events across Maryland, please sign up for our email newsletter. Annapolis (first certified in 2014), Bladensburg (first certified in 2014), Bowie (2016 Sustainability Champion; first certified in 2014), College Park (first certified in 2014), Colmar Manor, Edmonston (first certified in 2014), Frederick (first certified in 2014) Gaithersburg (first certified in 2014), Havre de Grace, Hyattville (first certified in 2014), Middletown, Ocean City, Salisbury, and Thurmont.